With everyone asleep I have managed to upload some tiny pictures, but the one “not an A road” sums up the issue. Should I opt for keeping to the back roads with their interest, steeps and beauty or should I take the low road and be in Scotland afore ye? The A road will be flatter, smoother, faster, easier, but duller. My legs are tired and want it to stop, they need to be back and sitting in the office. The A road is my chance of finishing and getting to Edinburgh. It would all stop and go away and I could never do it again. Whereas the back lanes would give interest and intrigue and will make me want to do it again. I know what the old man of the road would do and we should learn from him. It’s not a race, take your time and enjoy it! I am enjoying your blogs and your trip sounds great. 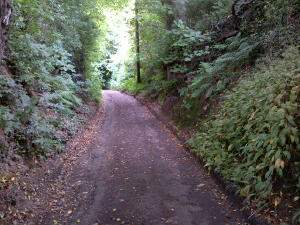 This back road looks lovely and what the trip is about……..but life and business and everything has to go on! It does not sound as if you could have done this for ever. What an entertaining blog. Witty, informative and with a touch of the philosophical. Well done Jim!